Although globally, lobster production is dwarfed by finfish, seaweed, and mollusk production, lobster fisheries are critical to local and regional economies. 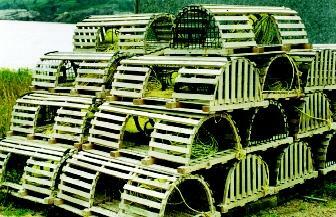 These lobster traps in Nova Scotia, Canada await next year's fishing season. This seaweed plantation in Bali, Indonesia illustrates the role of mariculture (marine aquaculture) in meeting human food demands. 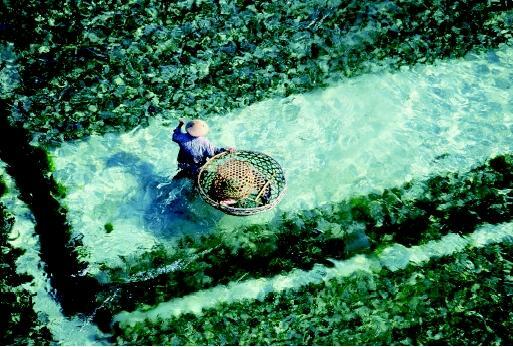 Global seaweed production exceeds 10 million metric tons annually. With respect to finfish, the herring, sardine, and anchovy group is used primarily for the manufacture of fish meal. That product is used to feed poultry, swine, and various species produced by aquaculturists. The cod, hake, and haddock group is commonly sold as fish fillets and fish sticks. Those fishes are also used to make artificial crab, shrimp, and other products that mimic more expensive seafoods. The cod fishery of the United States, once one of the largest in the world, collapsed in the 1990s because of overfishing. Despite the popularity of lobsters, the primary crustaceans produced in the world are shrimp, with the majority of those coming from salt water. However, significant amounts of fresh-water crustaceans also are produced, with much of that production coming from crayfish. There also is a modest amount of fresh-water shrimp production. Seaweeds are consumed directly as human food and are used in a variety of food and household products. Brown and red seaweed constitute most of the production, with much lesser amounts from green seaweed. Other aquatic plants include watercress, water chestnuts, and various other edible species. Reptiles used for human food include alligators and turtles. Marine turtles are protected by some nations, but those are not the only turtles that are consumed around the world. Both alligators and turtles are captured and cultured. Most nations have banned the capture of marine mammals, such as whales, but there continues to be some commercial harvest by Japan, and small numbers are taken by native peoples, such as some tribes of Native North Americans that historically depended on whales and other marine mammals as a primary food source. Unlike reptiles, marine mammals are not being cultured for food. The importance of seafood in the human diet varies greatly around the world. In the United States, consumption is roughly 7 kilograms (about 15 pounds) per person per year. That amount is small compared with various other nations. The Japanese, for example, rely heavily on seafood for their animal protein. Seafood consumption, per individual, is at least five times higher in Japan than in the United States. Terrestrial animals, such as beef and pork, are more expensive than seafood in Japan; consequently, that country has a fishing fleet that travels far and wide. The Japanese also purchase seafood from other nations and have a highly developed aquaculture industry. China and Japan are not the only countries with high individual annual fish consumption rates. With a leveling off of the world's seafood supply from capture fisheries, and with continued human population growth, it is anticipated that global demand for seafood will greatly exceed supply in the early twenty-first century unless aquaculture production is greatly increased. While seafood consumption in many nations was once largely dependent on locally captured or cultured species, the development of freezing and rapid transport by rail, truck, and air have made a variety of seafoods available throughout developed nations. Fresh salmon often is as readily available in areas distant from the ocean as in locations where the fish are captured. The popularity of seafood has increased in recent years because it is seen as being a health-promoting food source. Many seafoods have high levels of a type of fat that is regarded as healthful by medical researchers. Salmon are an example of a fairly fatty fish that fits this category. Other species, such as halibut, are very low in fat, so they are popular with people who want to limit their daily fat intake. SEE ALSO Algal Blooms in the Ocean ; Aquaculture ; Bivalves ; Cephalopods ; Crustaceans ; Fish ; Fish, Cartilaginous ; Fisheries, Fresh-Water ; Fisheries, Marine ; Mariculture ; Marine Mammals ; Reptiles. About Fisheries: Production. Food and Agriculture Organization of the United Nations. <http://www.fao.org/fi/Prodn.asp> .